Who needs expensive fertilizers when they have worms doing the same task for them in the garden. Red worms are marvelous creatures who do wonders with your top soil. They loosen up the soil, making it ideal for plant growth. Apart from that they increase the level of nutrients including magnesium, nitrate and phosphate in the ground. Yes this all is done by fertilizers at a much larger cost to your pocket. while there are many worm producers out there, willing to provide you with boxes of worms for your garden, why spend when you can breed them yourself without much of an effort and cost. Worms take very little time to reproduce and soon you will have enough to start supplying to other gardeners. Our step by step guide has everything needed to breed red worms. Commercial worm containers are available in the market but you can easily turn an old tub or bin into a worm habitat. Just make sure that it is chemical and rust free. Drill a drainage hole at the bottom of the bin to prevent any water logging. You can take one large bin or several small ones. Just make sure that it has enough space for the worms. Once you have decided on the container, set up the bedding for the worms. Bedding material could include shredded cardboard, newspaper, aged straw, fall leaves and peat moss. Worms love fall leaves. Moist up the bedding a bit and cover the container for a couple of days before adding the worms. It is ideal to mix in food waste with the bedding a few days before the arrival for worms. This will make the perfect setup for thriving worms. Waste material out of your kitchen like vegetable & fruit waste, bread crumbs and tea bags make the best compost for worms. However, keep away any human waste, chemicals and oils from the container. 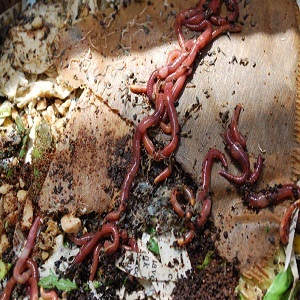 Mix the waste with the bedding and cover the container until you introduce the worms. Get red worms from commercial worm suppliers or friends and neighbors who breed worms. You just need a small quantity because soon they will reproduce at an exponential rate. Add the worms to the bin and place the cover. Keep refreshing the food waste every week and also add ore shredded newspapers and some water. Your worms will multiply in no time.